ROLLER was designed by a mom tired of seeing her children carrying heavy backpacks, and of wheelie bags that break after just a few months of use and are cumbersome or uninteresting for children to carry around. Many parents can relate and are already calling ROLLER the most innovative children´s product in a long time. For inspiration on the design all existing schoolbags on the market were set aside, in order to produce one that would look strikingly different, and with an unforeseen functionality and ease of use for children. No one had ever thought of extra large wheels and although it was risky, we were confident it was the right design choice to provide an unprecedented level of functionality and style. The ROLLER school and travel bag with wheels is the first one on the market with very BIG and sturdy wheels (17,5 cm diameter), and the sleekest looking bag on the market yet for children aged 7-12 years. The BIG wheels are not just attractive to look at, they are also quiet and practically indestructible. Furthermore, big wheels make this bag extremely easy to maneuver on all kinds of surfaces, and to effortlessly go up and down stairs or sidewalks. The big wheels also provide greater stability as they keep the bag from tilting from one side to the other while being dragged. 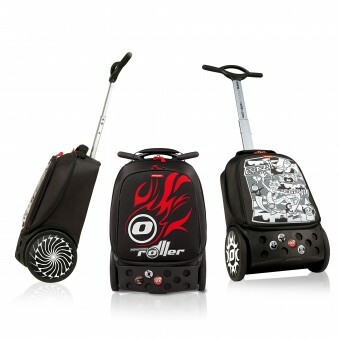 Children love the reliability the big wheels provide as the Roller bag literally "follows" them wherever they go. The sturdy ergonomic handle is adjustable in height to adapt to the growing child, and is shaped like a scooter handle, thereby inviting children to push the bag in front of them (much in the same way adults push shopping carts), which is not only the doctor-approved position to avoid shoulder and wrist injuries, but also a position providing great entertainment for children as they race eachother and invent related games. It is also possible to tow the bag in the more traditional position. With 19 liters capacity and multiple compartments, everything fits in a neat and organized manner. There´s even an insulated pocket to keep drinks or snacks cool, and a laptop case that securely attaches inside the rigid backside of the bag, as more and more children are starting to take notebook computers to school. 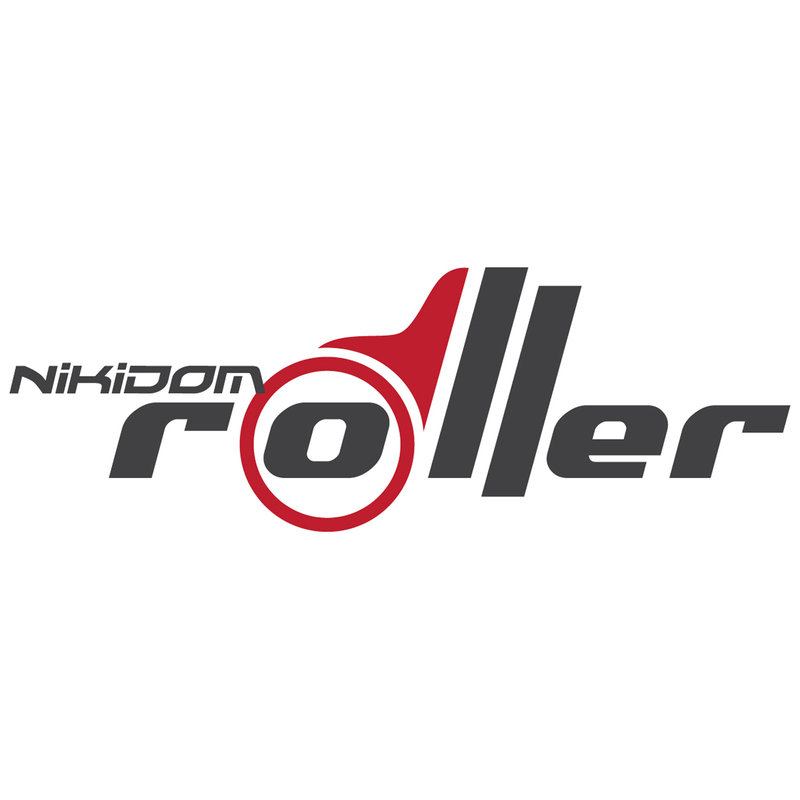 Nikidom ROLLER is made of the highest quality materials and was built for durability and to withstand the punishing use school and travel bags are subjected to by children. The bottom protector part is made of rigid material in order to protect the fabric part of the bag from scratches, as well as the contents. What´s more, ROLLER has passed the same durability tests as the leading brand in suitcases. Parents love the fact that with ROLLER, children are not carrying heavy loads on their backs, and that this sturdy bag will last a long time. Kids love that they can personalize their Roller with Pins that can be fitted into the holes of the bottom protector, and which they can collect and exchange with their friends. Kids can further customize their bag with cool wheel stickers that provide an interesting optical effect once the wheels get moving. These design accessories provide children with an element of interaction with the bag which nurtures both their natural tendency for play and expression of their personal tastes onto their belongings. ROLLER is a completely new and unique school and travel bag, and the only one to combine an unmistakable smart and stylish design, incredible functionality, and tested quality. The Physioterapist Association in Spain has already granted their seal of approval as it meets all required ergonomic factors for children´s well-being in this product category. 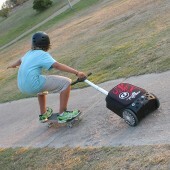 Nikidom ROLLER schoolbag is more maneuverable than other schoolbags due to its oversized wheels of 17,5cm in diameter. The big wheels make it easy to go up and down stairs sidewalks, and keep the bag from swinging from side to side thereby making it incredible stable and easy to move around. In addition, the wheel tire is made of polyurethane, thereby ensuring the wheels will be both smooth and silent. The ergonomic push/pull handle makes it easy to push the bag in front, like a shopping cart, making it much more ergonomic and causing less shoulder and wrist strain when pushing (much preferred position by physiotherapists). This handle is also shaped like a scooter handle, thereby making it fun and inviting for hildren to push the bag in front of them, rather than dragging it behind in the usual position. Project began in Barcelona in the middle of 2008 and was launched in Spain in August 2012. Telescopic tube made of sturdy light aluminum, bottom protector piece made of solid polypropylene, and wheel tires have polyurethane covering to make them silent. Research was conducted among doctors, parents, and children alike to develop a product that would be desirable for all three of these important groups. Doctors stated their concern with children carrying more than then allowed 10-15% of their body weight in a backpack, and the troubles this could cause in the spine as bones are still not totally formed in the target age group of 7-12 years. They also stated their concern with current trolleys being difficult to maneuver, and also causing potential strain on the shoulder and wrist as the weight is dragged behind the body. Parents expressed their concern on the one hand about their children carrying backpacks they could hardly carry themselves, and also their dislike of wheeled bags that typically break after just a few months of use. Both parents and doctors expressed their wish for a wheeled bag that was both ergonomic and very durable. All the above data was collected primarily through personal interviews. Once the product was in the advanced prototype stage, 50 children throughout different schools in Spain were each given a sample to test, and the product was modified to meet their needs: more silent wheels, additional foam handle, etc. Children´s thoughts were collected through questionnaires they filled out themselves. The most difficult part was to create a schoolbag with wheels children would like to take to school. Many children prefer backpacks because current trolley bags are cumbersome, difficult to maneuver and genereally "not cool". With the super sporty design, attractive big wheels, handle shaped like a scooter, and accessories to personalize and collect for the bag, kids are LOVING Roller! The other challenge faced was to create a product that could be both made of high quality materials, but also affordable in price. Currently in the market the ROLLER bag is above the average price for wheeled schoolbags, but parents happily pay the price difference as the product quality is immediately visible, and regard the cost outlay more as a good investment that will last for years, rather than just another expense. Nikidom is a company based in Spain and dedicated to the distribution of highly innovative products for children since 1998. Nikidom is the exclusive distributor in Spain for some of the world´s most famous brands for babies and young children. Since 2008, the company has been involved in developing its own highly innovative products for babies and children. Nikidom Roller Schoolbag by Sylvie Cherian is a Nominee in Fashion and Travel Accessories Design Category. · Click here to register today inorder to be able to view the profile and other works by Sylvie Cherian when results are announced. Nikidom Roller Schoolbag by Sylvie Cherian is Winner in Fashion and Travel Accessories Design Category, 2012 - 2013. · Read the interview with designer Sylvie Cherian for design Nikidom ROLLER here. · Press Members: Login or Register to request an exclusive interview with Sylvie Cherian. · Click here to register inorder to view the profile and other works by Sylvie Cherian. Did you like Sylvie Cherian's Accessory Design? Did you like Nikidom Roller Schoolbag? Help us create a global awareness for good accessory design worldwide. Show your support for Sylvie Cherian, the creator of great accessory design by gifting them a nomination ticket so that we could promote more of their great accessory designs.